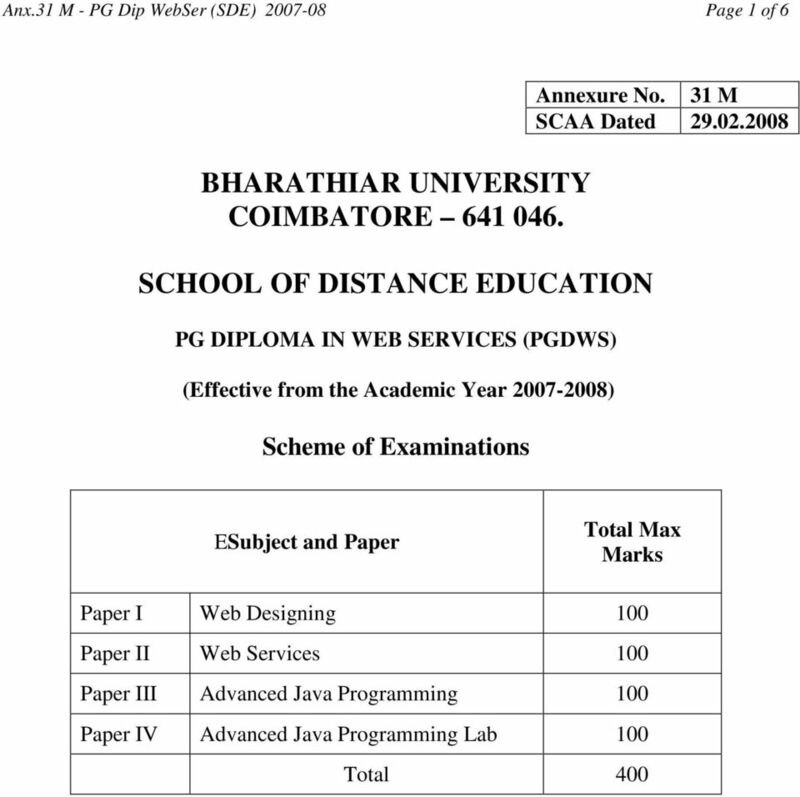 Download "BHARATHIAR UNIVERSITY COIMBATORE 641 046. 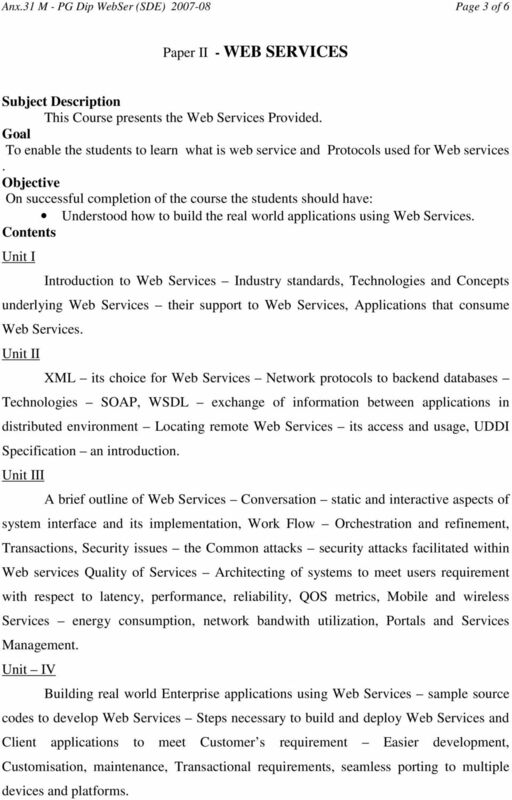 SCHOOL OF DISTANCE EDUCATION"
3 Anx.31 M - PG Dip WebSer (SDE) Page 3 of 6 Paper II - WEB SERVICES Subject Description This Course presents the Web Services Provided. 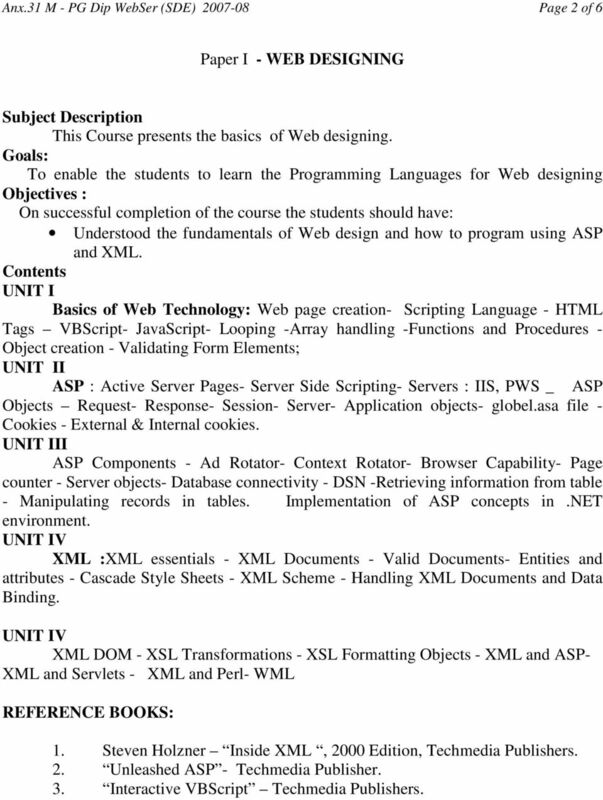 Goal To enable the students to learn what is web service and Protocols used for Web services. Objective On successful completion of the course the students should have: Understood how to build the real world applications using Web Services. Contents Unit I Introduction to Web Services Industry standards, Technologies and Concepts underlying Web Services their support to Web Services, Applications that consume Web Services. Unit II XML its choice for Web Services Network protocols to backend databases Technologies SOAP, WSDL exchange of information between applications in distributed environment Locating remote Web Services its access and usage, UDDI Specification an introduction. Unit III A brief outline of Web Services Conversation static and interactive aspects of system interface and its implementation, Work Flow Orchestration and refinement, Transactions, Security issues the Common attacks security attacks facilitated within Web services Quality of Services Architecting of systems to meet users requirement with respect to latency, performance, reliability, QOS metrics, Mobile and wireless Services energy consumption, network bandwith utilization, Portals and Services Management. Unit IV Building real world Enterprise applications using Web Services sample source codes to develop Web Services Steps necessary to build and deploy Web Services and Client applications to meet Customer s requirement Easier development, Customisation, maintenance, Transactional requirements, seamless porting to multiple devices and platforms. 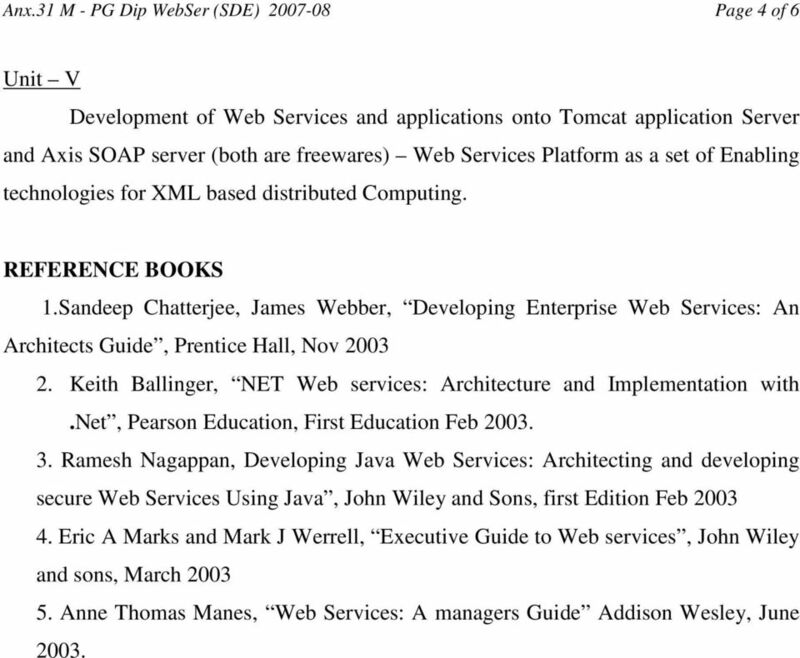 4 Anx.31 M - PG Dip WebSer (SDE) Page 4 of 6 Unit V Development of Web Services and applications onto Tomcat application Server and Axis SOAP server (both are freewares) Web Services Platform as a set of Enabling technologies for XML based distributed Computing. REFERENCE BOOKS 1.Sandeep Chatterjee, James Webber, Developing Enterprise Web Services: An Architects Guide, Prentice Hall, Nov Keith Ballinger, NET Web services: Architecture and Implementation with.net, Pearson Education, First Education Feb Ramesh Nagappan, Developing Java Web Services: Architecting and developing secure Web Services Using Java, John Wiley and Sons, first Edition Feb Eric A Marks and Mark J Werrell, Executive Guide to Web services, John Wiley and sons, March Anne Thomas Manes, Web Services: A managers Guide Addison Wesley, June 2003. 6 Anx.31 M - PG Dip WebSer (SDE) Page 6 of 6 - The JAVA2D API Swing overview Jlabel Event handling model JtexField, JpasswordField, Jbutton, JcheckBox, Jradio Button, JcomboBox, Jlist, JtextArea, Jslider Mouse event handling, Adapter classes Layout managers Panels Using menus with frames Boxlayout manager. Unit IV The basics of JAVA exception handling Try blocks Throwing,Catching and Rethrowing an exception Throws clause finally block Class Thread: an overview Thread states Thread priorities and scheduling Thread synchronization Runnable interface Thread groups Loading, displaying and scaling images Files and Streams Creating, Reading and Updating a sequential access file Creating, Writing and Reading a random access file Class file Reading, Inserting and Updating a database (Use JDBC to a MS Access) Unit V Overview of Servelet technology - Handling HTTP GET and POST requests Session tracking RMI: defining, implementing the RMI Define the Client Compile Execute the server and the client Networking : Reading a file on a web server Establishing a simple server and a simple client (using stream sockets) Random and BitSet Class Class arrays Interface Collection and Class Collections Sets Maps JAVABEANS : Preparing a class to be a JavaBean Creating a JavaBean Adding Beans and Properties to a JavaBean Connecting Beans with Events in the BeanBox the BeanInfo class. 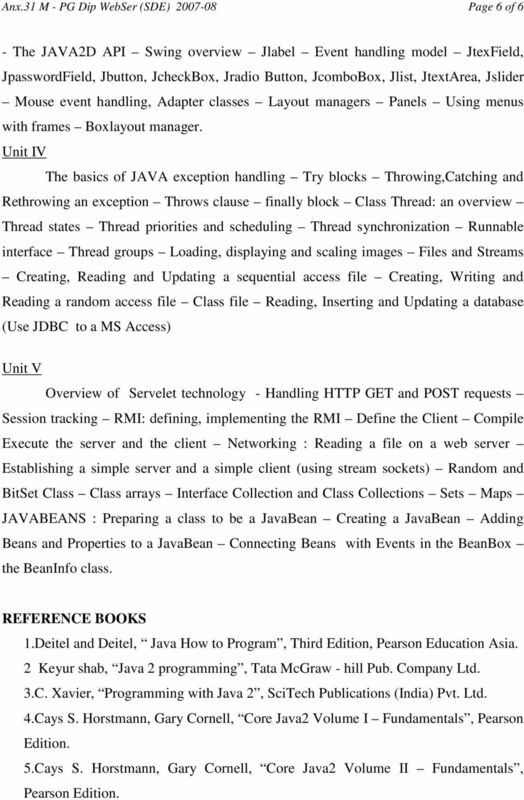 REFERENCE BOOKS 1.Deitel and Deitel, Java How to Program, Third Edition, Pearson Education Asia. 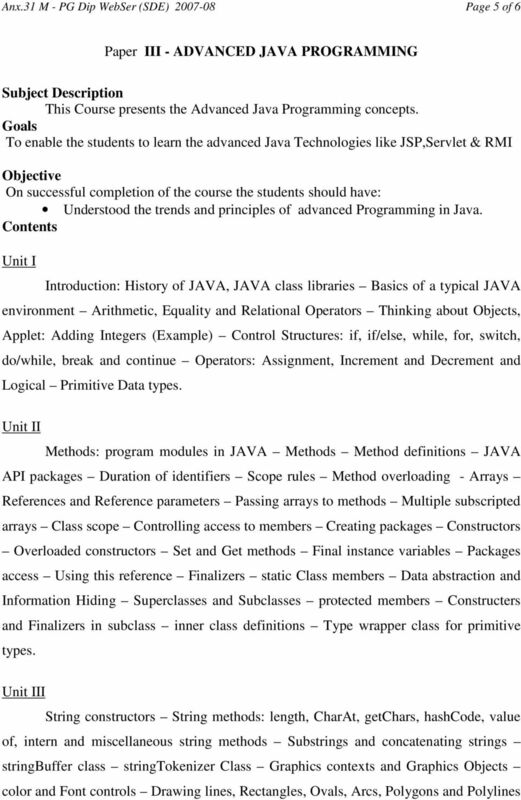 2 Keyur shab, Java 2 programming, Tata McGraw - hill Pub. Company Ltd. 3.C. Xavier, Programming with Java 2, SciTech Publications (India) Pvt. Ltd. 4.Cays S. Horstmann, Gary Cornell, Core Java2 Volume I Fundamentals, Pearson Edition. 5.Cays S. Horstmann, Gary Cornell, Core Java2 Volume II Fundamentals, Pearson Edition. JAVA. EXAMPLES IN A NUTSHELL. O'REILLY 4 Beijing Cambridge Farnham Koln Paris Sebastopol Taipei Tokyo. Third Edition. Server-Side Web Development JSP. Today. Web Servers. Static HTML Directives. Actions Comments Tag Libraries Implicit Objects. Apache.